Trying to decide between a TV and a projector for your next display purchase? Sometimes the answer is obvious: a dedicated, light-controlled home theater room begs for a dedicated home theater projector, while a super-bright living room generally requires a super-bright LCD TV to match. For those who fall in between, however, the answer may not be as clear-cut. A whole new crop of "home entertainment" projectors has emerged that is targeted at the more casual viewer who wants the big-screen benefits of front projection but doesn't have the dedicated room and cannot (or just doesn't want to) accommodate all the other pieces of a true home theater system, like the AV receiver and surround sound system. It's important to understand upfront that these home entertainment projectors really aren't targeted at the videophile: They are usually lower-priced projectors that emphasize image brightness over black level to suit a more casual, non-light-controlled room environment. They also try to mimic the TV experience by adding features like an integrated speaker and enhanced connectivity with network/USB sources. With the new PF85U DLP home entertainment projector, LG takes that "mimic the TV experience" idea to a whole 'nother level. This 1080p projector is essentially an LG Smart TV in a projector chassis: It includes the company's complete Smart TV Web platform with built-in WiFi and WiDi, the motion-controlled Magic remote with voice search, a built-in DTV tuner, and an integrated speaker. Oh, and projector enthusiasts might be interested to know that the PF85U eschews the traditional bulb for an RGB LED light source. 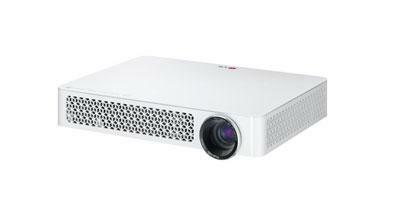 LG does not specify which TI chip is used in this DLP projector, but the brightness rating is listed at 1,000 lumens, and the stated contrast ratio is 100,000:1. All of this comes in a petite (10.8 x 8.8 x 2.2 inches), easily portable, glossy-white box that weighs just 4.8 pounds...and all of it will cost you $1,299. The PF85U's lens is positioned at the far left of the unit, with a manual focus ring around it. Fan vents running along each side panel, while the top panel appears to sport only an LG logo. Upon closer inspection, you'll find a set of touch-capacitance buttons that illuminate for power, navigation, enter, and "S" for Smart TV access. Around back, the connection panel includes two HDMI 1.4 inputs (one of which supports MHL to connect a compatible smartphone or tablet), plus mini-jacks for component video and standard AV input (adapter cables included). I connected my Dish Hopper DVR and Oppo BDP-103 Blu-ray player via HDMI. Unfortunately, the HDMI ports do not support Audio Return Channel (ARC); so, if you'd prefer not to use the integrated speaker (which is highly likely, once you hear it), your options are optical digital audio or a headphone jack that can serve as a basic stereo audio output. A LAN port is available for those who prefer a wired network connection over the built-in WiFi, and two USB ports are available for media playback. The PF85U lacks RS-232 and a 12-volt trigger. LG includes two remotes in the package: the basic IR model includes a wide array of buttons for setup, navigation, and smart TV control, while the Magic remote communicates over Bluetooth and does not require line-of-sight. Its minimalist button layout includes power, back, smart, microphone, volume, channel, mute, help, quick menu, and a navigation pad that surrounds a wheel that serves as both the enter key and a scroll wheel. The Magic remote has motion control: give it quick side-to-side shake, and a pointer appears on screen that aids with navigation. It's especially helpful when moving around the Smart TV menu and the built-in Web browser. The remote can be easily set up to control your cable/satellite set-top box without the use of an add-on IR blaster (more on this in the Performance section). LG also offers a free iOS/Android control app to control the projector over the network. While the PF85U has a ton a TV-like features that you don't expect to find in a projector, it's missing some features that you do like to see in a projector. There's no lens shift to help position the image on your screen, which is a common omission at this price point. However, there's also no zoom at all, no onscreen pattern to help size/focus the image, and no adjustable feet. A single twist-down post on the bottom allows you to angle the projector upward, and vertical keystone is available, but that's it. The PF85U supports a screen size of 20 to 120 inches (with a throw distance of 24.8 to 146.4 inches, respectively). The projector's "ratio of upward projection" is 100 percent, meaning that the bottom of the projected image is right in line with the lens height. This is a good thing for a projector that is likely to sit on a tabletop. Since there's no vertical lens shift, if you want the image higher on the wall, you need to set the projector on a higher surface; you can mount it on a tripod, if desired. It can also be set up for a rear-projection system. The PF85U offers multiple picture modes (vivid, standard, cinema, game, and two expert modes) and a healthy complement of picture adjustments, including: multiple color gamut options (standard, wide, BT709, ECU, SMPTE); three gamma presets (1.9, 2.2, 2.4); two- and 20-point white balance controls; a six-point color management system; Super Resolution; noise reduction; and LG's TruMotion control to reduce film judder. LG's Picture Wizard II feature is onboard to walk you through a basic adjustment of controls like contrast, brightness, color, and tint. Aspect-ratio options are 16:9, Just Scan, Set by Program, 4:3, Zoom, and Cinema Zoom 1 to zoom in on 2.35:1 sources. On the audio side, you can enable LG's Smart Sound mode for the two five-watt speakers, or you can choose from six sound modes. Clear Voice II can (and does) help with dialogue intelligibility, and AV sync is available to align the audio and video signals. One reason why some projector enthusiasts are excited about LED projection is the extended lamp life it offers compared with a traditional bulb. LG claims 30,000 hours for the LED light source, whereas 4,000 to 6,000 hours is a common spec for a bulb. Plus the LED source purportedly doesn't dim as significantly as a bulb over its lifespan. Another perk of LED is the rapid on/off function; this baby powers right up, with no need to wait for the bulb to reach full brightness, and it shuts down instantly.